Terracon International B.V were contracted by Storia Enso Oy last year to supply and install of approximately 1,800 DCIS-piles with a shaft diameter Ø 324 mm, lost footplate Ø 370 mm, ranging from 20 m up to 30 m in length, in total over 40.000 m. The contract value was € 3.5 million. The works consisted of the supply and installation of 1.800 Vibro driven-cast-in-situ piles with a shaft diameter Ø 324 mm with footplate Ø 370 mm and pile lengths ranging from 20 to 30 meters. The subsoil of the brownfield jobsite consists over the top 5 to 10 m of a fill out of debris, stones, boulders, logs, existing concrete foundations and other man-made obstacles along the shoreline of lake Saima, which was filled along the existing paper mill the sixties and seventies of the last century and now used to build the extension on. The location, depth, size and nature of the obstacles were unknown, but they appeared to be more in number and size than was expected, causing serious delays due to less daily production and due to bended casing (despite the stiffness of the casing Ø 324 x 25 mm). This fill was overlaying an 5 to 10 m thick soft clay layer, followed by coarse sand, gravel and/or weathered rock as end bearing layer for the piles. Pile loads were around 1.000 kN. These subsoil conditions made it impossible or at least highly risky to install driven precast-piles. To penetrate through all the obstacles, DCIS-piles were chosen with a casing Ø 324 mm with a wall thickness of 25 mm to obtain maximum stiffness. In areas without obstacles, this was possible, but when encountering obstacles this was reduced to 50% or less. Finally the works were completed using 4 rigs, one for pre-driving and three rigs for actual pile production. As most industrial projects, these piling works were under extreme time pressure to avoid severe winter conditions (usually mainly from December/January into March) for both the piling works and concrete foundations and allow for erecting the steel structures in the winter. 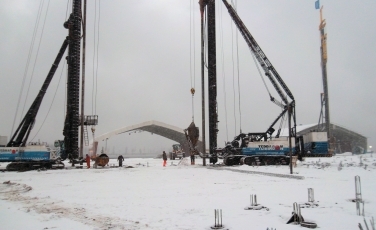 Despite 16 bended casings Ø 324 x 25 mm (for actual pile production) and 3 bended casings Ø 450 x 40 mm (for pre-driving) and minimal winter conditions (snow fall) the piling works were completed with a slight delay by the middle of December, without effecting the works thereafter. The DCIS-piles and the proposed method of pre-driving appeared to be a successful solution for this project on this particular location with numerous unknown underground obstacles. Terracon International B.V began the works in September 2016 and finished in December 2016.